It wasn't so long ago that the official 'indie-jam' of the summer was "The Comeback", a delectable nugget of 8-bit fueled pop rock from the land of Sweden. A little more than two years later, Swedish rock has undergone a resurgence of sorts (although I'm not sure it's ever been that prevalent, ABBA doesn't really count). With bands like Peter, Bjorn and John and The Hives achieving new heights here in the US (various TV ad soundtracks and a tour with Maroon 5 respectively), it seems the country as a whole has become a little more accepting of our friends from Europe. The Shout Out Loud's newest disc should satisfy those with a continuing thirst for Stockholm-centric rock. Produced by none other than Bjorn Yittling (of the aforementioned Peter, Bjorn and John fame), Our Ill Wills is a logical step forward for the band. Bjorn's production work is immediately evident on the record's first track "Tonight I Have to Leave It", as swelling strings and cowbells come to the forefront of the mix. The arrangements in general make this record superior to their last, with ample use of percussion and keyboards to provide more varied textures than the guitar-driven norm. That's not to say there aren't a few rockers thrown in for good measure, "Time For Love" and "You Are Dreaming" both provide ample up-tempo thrills. But it's the more subdued tracks that prove to be the most interesting. "Normandie" finds the group channeling an acoustic groove, accompanied by tambourine, maracas and woodblock as Olenius laments a mis-advised trip to the beach. 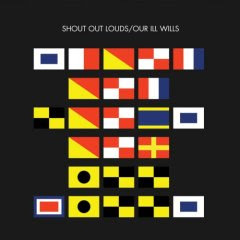 Strangely enough, title track "Ill Wills" is an instrumental piece, a slowly building xylophone driven stomp that sounds something like a Swedish Sigur Ros. In true Shout Out Louds fashion, the record ends with an extremely long tune called "Hard Rain" that boarders on mindless jamming, before descending into noise and then fading into silence. All in all, it's a solid, enjoyable listen that so far has stayed in regular rotation on my playlist this week. It's not groundbreaking, but I really don't ask that from pop-rock. The Shout Out Louds handily avoid the sophomore slump by both gradual innovation, but more importantly, by not being afraid to stick to what works.